Philadelphia, PA (July 16, 2009) – Meredith DuBarry Huston, an attorney with Manko, Gold, Katcher & Fox, LLP (MGKF), an environmental, energy and land use law firm, has earned the designation of Leadership in Energy and Environmental Design (LEED) Accredited Professional (LEED AP) under the United States Green Building Council (USGBC) professional credentialing program. Huston, who has written on the potential liability risks associated with green building, is one of a limited number of attorneys in Pennsylvania to have achieved this designation. She pursued the LEED AP designation in order to advise clients with respect to LEED certification matters and to better serve clients in dispute resolution matters arising in the green building context. Huston joins Brenda Hustis Gotanda, a partner with MGKF, and in-house technical consultant, Michael Nines, a Pennsylvania-licensed professional engineer, both whom received LEED AP accreditations during the past year. 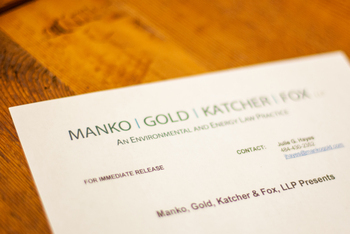 Manko, Gold, Katcher & Fox, LLP, is a member of the USGBC.